Discussion in 'Paddles and Paddle Making' started by Just1moredave, Nov 21, 2018. I was doing pretty good following the advice in Canoe Paddles: A Complete Guide To Making Your Own. But I decided to make the blade pretty thick and thin it down later. Then I had a problem - how to make sure I remove the same amount of wood from each side? I clamped the shaft to my workbench and made this simple step-over bar out of scraps. Now it is really easy to see where to remove wood. I can measure down from the bar if I want. To remove the wood effectively, I am using a wooden molding plane, a #6 round, like it was a scrub plane. 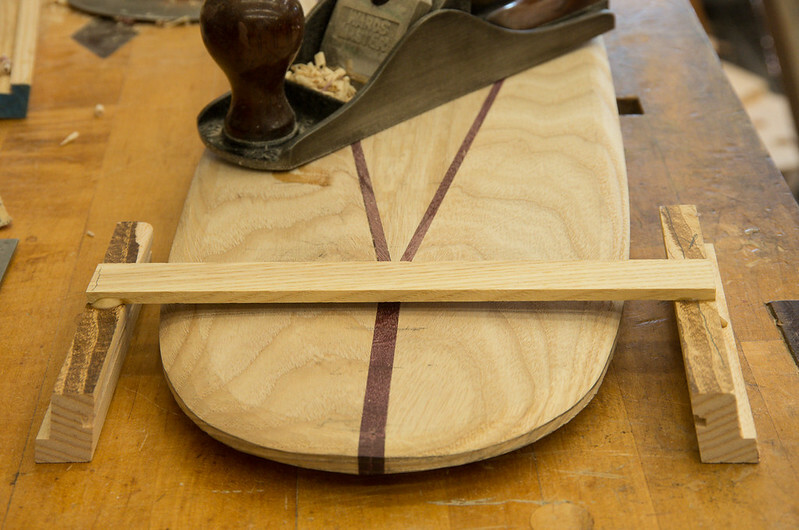 It's narrower than a typical scrub plane and the blade goes right to the edge, so it's easier to maneuver around and respect the wood grain. Next time I'll just cut closer to the lines with the band saw.